Check out the first part of this series “Why You Can’t Trust Real Estate Agents When Buying A House“. Yesterday, we discussed how your agent and you will have similar goals when starting a house search but your interests will diverge the closer you get to a deal. When selling a house, the same phenomenon happens but usually a lot quicker. Usually when you agree to list your house with an agent they will make you sign a contract with them which ensures that you don’t turn around and sell the house with another agent after they have done some work. In my experience, the agent will pull various comparable houses in the area and together you will figure out an asking price. Another step that normally takes place is for the agent to do a walk through and advise the client of possible improvements they can do to the house to make it sell easier. The asking price is usually the first potential source of conflict – the seller wants a high price and is often unrealistic about what their house is worth. The agent knows that if the house is listed too high that it will sit for a while and any effort the agent makes to sell the house will be a waste of time. Agents make more money by selling more houses rather than getting a high price for each house so they want to make sure that the house is listed at a reasonable market value or lower. This is why pricing a house low for auction is so popular because it’s the best situation for the agent. Another situation is if a client wants to price the house high – then the agent has to bide their time and work on the client to lower their price so it will move. Thinking about accepting an offer – Trust no one! “Since I get paid on commission – the more you get for your house, the more I get paid so we both want the same thing”. This is one of the biggest lies in real estate. Yes, mathematically an agent will get more commission if your house is sold for a higher price but the problem is the amount of time it might take to get that higher price is not worth the extra commission. For example if your house has a market value of $400,000 then your agent’s cut might be 2.5% or $10,000. If you are patient and wait for someone to come along who will pay $410,000 then the agent will make $10,250 for an extra $250. To get this $250 they might have to do several open houses and wait quite a while. Clearly they are better off just selling the house for $400k (or even less) and taking their $10,000. The problem is that the difference in selling price to the agent is pocket change but the difference to the homeowner is huge since we are talking about a $10k difference. Negotiation – don’t listen to a word your agent has to say. At this point you are potentially pretty close to selling your house. You want to sell the house at the highest price, the buyer wants to buy the house at the lowest price and your agent just wants you to sell the house and doesn’t care at all what price you sell it for because they just want the deal done right now. Since selling at a lower price will get the deal done quicker a lot of agents will encourage you to counter lower which basically means that you are negotiating against them as well as the seller. “Don’t counter offer too high or the buyer might walk”. If the buyer has put in an offer then it’s up to the seller to accept the offer or reject it with a counter offer. It’s true that a high counter offer might scare off the buyer but isn’t that part of the negotiation? “Your first offer is often the best offer”. Another way an agent might phrase this one is “We have an offer which means if I can get you to accept it by any means possible then I get paid very soon”. “Dual-agency means there is no conflict of interest even though I represent both parties”. The “dual-agency” scam is where a selling party has a real estate agent and a buyer comes along who doesn’t have their own agent. The selling agent will offer to “act” as both the selling agent and buying agent and of course collect double the commission. Even though this is such an obvious scam, I actually don’t think this one is a big deal since real estate agents are basically working against you anyways at negotiation time so adding more conflicts probably doesn’t really matter. “Are you willing to lose this deal for $12 a month?” This is part two of the previous point which is applied if you don’t bite on the first attempt. It’s also a more useful gambit if the “separation” is a bit greater. If you and the buyer are $12,000 apart then that sounds pretty significant but what if you are only $75 a month apart (for 25 years) or even better what if you are only $63/month apart (over 40 years). The more you educate yourself about the real estate market you are looking in and how real estate agents operate then the better off you will be when selling a house. Real estate agents are quite useful when selling a house because most people won’t buy from a private seller and because they have access to MLS. Whatever you do, never forget that they get paid when the deal gets done and only then. They don’t get paid for having extra open houses or walking away from close deals. Do you have any good “lines” that you were told when selling a house? Check out another perspective on real estate agents. 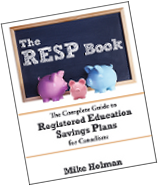 Everything you need to know about RESPs. Copyright © 2007-2015, Money Smarts Publishing (Investing and personal finance). All rights reserved, unless otherwise noted.